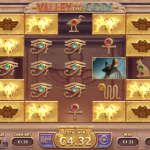 Valley of the Gods is a very good looking video slot game from Yggdrasil. 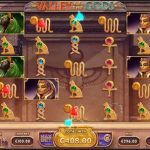 The game was inspired by Ancient Egypt a very well known theme that has been used in other slots before. But there is something new here that will attract you, improved special features and beautiful graphics. What surprised us the most was the fact that there are no wild or scatter symbols here in this game. So you are probably wondering what is left, and what symbol can help us improve our balance. Well we have ‘blocker’ symbols here which will come in handy. There are 12 scarab blockers that are placed on the outer reel with the first spin. Every time you land a win of 3 or more symbols the appropriate number of blockers will be removed and with every win more blockers will be removed. Once you clear all the blockers, the free spins feature will start. All the blue gems will add appropriate multipliers and all the red gems will add lives. The golden gems during the feature will add either multipliers or lives. With every non winning spin you will lose one life and the game is over when there are no lives left. 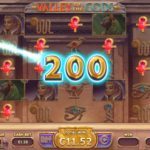 Valley of the Gods is an interesting video slot game that we like to play whenever we have the chance to. We are surprised how good and innovative all the games that come from Yggdrasil lately are. There are a plenty of things that we enjoy here in this game. For starters the game play is smooth and fun and there are special features that are way different from what we are used to see. For that reason we believe that you will enjoy this game too. For another great engaging slot you should consider playing Super Heroes a 5 reel slot by Yggdrasil.